The Best Aromatherapy blogs from thousands of top Aromatherapy blogs in our index using search and social metrics. Data will be refreshed once a week. Also check out Top Aromatherapy Youtube Channels list for Top videos on Aromatherapy. Aromatherapy newsletter is a comprehensive summary of the day's most important blog posts and news articles from the best Aromatherapy websites on the web, and delivered to your email inbox each morning. To subscribe, simply provide us with your email address. Chapel Hill, NC About Blog The School for Aromatic Studies has been instrumental in bringing the French approach, Aromatic medicine, to the U.S. understanding that essential oils can and should be used in many ways, if used with common sense and plant knowledge. Jade Shutes is a Aromatherapy school devoted to inspiring a new generation of aromatherapists. Facebook fans 51,257. Twitter followers 1,970. About Blog GuruNanda™ is a line of exquisite oils and diffusers designed to improve your health and well-being. Their aromatherapy products infuse your life with beautifully scented goodness for you and your family. The line of essential oils and diffusers are carefully developed and brought to the end consumer with a farm to shelf process. Facebook fans 50,760. Twitter followers 368. Pleasant Grove, UT About Blog AromaTools® was founded in 2008 by a professional team that has been using and publishing materials about essential oils for nearly two decades. Our commitment since 2008 has been to help you and your team achieve success by providing the most reliable, specific tools and resources available for the safe and effective use of certified pure, therapeutic-grade essential oils. Facebook fans 1,918. Twitter followers 16,123. About Blog The West Coast Institute of Aromatherapy specialize in aromatherapy education that allows one to naturally progress to the level of expertise desired resulting in Aromatherapy Certification. Their mission is to share accurate information on essential oils and aromatherapy in a fun, easy to understand way. Facebook fans 6,309. Twitter followers 132. Mountain View, CA About Blog Comprehensive up-to-date coverage for aromatherapy, aggregated from news sources all over the world by Google News. Walnut Creek, CA About Blog To the Cloud is the web’s most trusted vendor of high end aromatherapy products and accessories. Headquartered in the San Francisco Bay Area, they specialize in only the best vaporizers on the market today. Facebook fans 91. Twitter followers 39. UK About Blog When it comes to using essential oils, the internet is full of confusing and contradictory information – are they safe to consume or not? Is it safe to use essential oils in pregnancy? Should we use essential oils on our children? If you’re interested in learning the truth about aromatherapy and essential oils, check out my blog. Facebook fans 3,172. Twitter followers 2,780. Buckeye, AZ About Blog Be Kind Botanicals offers pure essential oils, hydrosols, carrier oils, aromatherapy accessories, and kindness for everyone. Using essential oils in a manner that is fitting for each of us, is personal. Supplying them direct from the artisan distillers that are just as passionate and kind as we are, is what Be Kind Botanicals does. Facebook fans 1,087. Twitter followers 15. Miami, Florida, USA About Blog Located in North Miami, FL, We pride ourselves on being a local business with safe and efficient products made in the USA. We got started in 2005 and have since been dedicated to providing well-being through an often overlooked sense, smell, in a revolutionary way, the air conditioning. The Doctor Aromas system is simple, but it has a far-reaching impact. Facebook fans 9,175. Twitter followers 1,243. About Blog This website provides information about aromatherapy and massage, with a bit of somatics and self care thrown in. It's for people interested in taking charge of their own health and self care. Carol Wiley is a former massage therapist with a deep interest in massage, aromatherapy, somatics, and self care. About Blog Nature's Gift Aromatherapy is a woman owned and operated aromatherapy supplier. They've been online since 1995 and supply healthcare professionals, hospitals, hospices, college AT courses, clinical aromatherapy courses, and, of course, people who just love use of these healing products. Facebook fans n/a. Twitter followers 2,508. Sydney, NSW About Blog Kirsten Smit is the owner and certified aromatherapist at Aromatic Boutique and blogger for Aromatherapy For Australia. On this blog Kirsten shares with you her knowledge of aromatherapy. All these aromatherapy products are created using 100% pure and unadulterated essential oils and natural plant based ingredients that are sourced from a trusted and highly reputable Australian supplier. Facebook fans 6,913. Twitter followers 1,346. About Blog Bioesse Technologies, LLC (Bioesse) was created to enhance the health and well-being of people worldwide through our innovative, high quality and effective inhalation technology and vapor delivery patches. Bioesse patches have successfully helped people access the numerous benefits of aromatherapy. Facebook fans 1,671. Twitter followers 33. About Blog Keep up with updates on essential Oils from Uncategory. About Blog Flower Essence Therapy is forming the framework for three of these projects. I have been using flower essences, an offshoot of homeopathy, for many years and have my own flower essence aromatherapy company. The tarot deck is based on flower essence therapy and is planned to be a tool in using this modality more effectively. Surrey About Blog Naturallythinking the home of handmade Aromatherapy and Bodycare products and supplies They provide atural cosmetic products and aromatherapy grown and produced in England, for effective skincare. They aim create and produce the highest quality aromatherapy and skincare products at an affordable price made with the best ingredients available. Facebook fans 27,372. Twitter followers 448. Melton Mowbray, UK About Blog Base Formula supply the finest aromatherapy essential oils & natural skin care beauty products. They provide therapists & aromatherapy lovers worldwide with premium EssentialOils, Skincare & Aromatherapy supplies. They are committed to only using 100% pure aromatherapy grade Essential Oils and premium quality cosmetic ingredients. Facebook fans 9,659. Twitter followers 10,581. About Blog Aromatherapy Blog by Cristina Proano-Carrion is all about essential oils uses, tips, recomendations, receipes and all about aromatherapy. Cristina Proano-Carrion have more than 18 years of experience formulating aromatherapy products for the spa, fitness and hospitality industry. What really inspires her is sharing the health benefits and magic of these amazing essential oils. Facebook fans 5,240. Twitter followers n/a. About Blog GreenVapes, the UK’s no.1 superstore for Vaporizers and aromatherapy products. They provide portable, handheld & desktop Vaporizers. Facebook fans 321. Twitter followers 5. About Blog Amrita Aromatherapy supplies the best organic essential oils and makes aromatherapy blends, body oils, perfumes, natural skin care products and diffusers. Dr. Christoph Streicher founded Amrita Aromatherapy with the purpose of offering only the finest essential oils from all continents, to generate an aromatherapy line for your health, well-being and upliftment. Facebook fans 5,629. Twitter followers 1,564. Maumee, OH About Blog Terri Lohman is a diehard believer in complementary medicine. Complementary therapies, such as herbs and/or essential oils, bring great symptom relief to the common cold and allergies and many other common minor ailments. She has over 40 years of experience in conventional medicine as a nurse/nurse midwife/family nurse practitioner. Facebook fans 76. Twitter followers 14. Asheville NC About Blog Dreaming Earth Botanicals, have been providing Aromatherapy Supplies to the healing arts community since 1997. They supply their essential oils and other aromatherapy products to spas, massage centers, chiropractic and acupuncture clinics, food co-ops, pharmacies and retail shops. Facebook fans 1,473. Twitter followers 57. Selinsgrove, PA, USA About Blog Aromatic Wisdom Institute is recognized by the National Association for Holistic Aromatherapy (NAHA) as a qualified school of Aromatherapy. They offer a variety of workshops in the practical application of essential oils and a 235-hour Aromatherapy Certification Spring and Fall. Liz Fulcher is a veteran Essential Oil Educator and "Voice of Aromatherapy" on the popular Aromatic Wisdom Podcast. Facebook fans 12,748. Twitter followers 2,466. Santa Barbara, California About Blog Aroma Foundry sources high quality aromatherapy essential oils with country of origin transparency and is dedicated to changing the essential oil industry. Aroma Foundry has spent years scouring the globe for the finest 100% pure essential oils so that you can enjoy the world of essential oils with confidence. Facebook fans 100. Twitter followers 66. Southern Oregon About Blog AromaCulture is an aromatherapy magazine and herbalism magazine presenting educational articles, case studies and recipes from professional aromatherapists, herbalists and holistic practitioners from a holistic herbal aromatherapy point of view. Facebook fans 193. Twitter followers 108. About Blog Suppliers of Aromatherapy products worldwide, Purple Flame is one of the longest established Aromatherapy companies in the U.K; with an exceptional reputation in the industry. Quality and purity of essential oils is very important and we pride ourselves in sourcing and supplying only the purest quality essential oils. Vancouver, BC About Blog AromaTech manufactures 100% pure essential and aroma oils, home fragrance diffusers and commercial air scenting machines. AromaTech's cold air micro mist scent machines transform the perception of your commercial identity and environment and enables businesses to create a unique experience by engaging memory and emotions. Facebook fans 1,663. Twitter followers 100. Sedona, Arizona About Blog Body Bliss’ collection of handcrafted essential oils and aromatherapy products are curated without compromise. We believe in quality, beauty, and intention. Body Bliss provide the finest organic and therapeutic grade essential oils. Facebook fans 764. Twitter followers 242. Sedona, AZ About Blog Learn about essential oil uses and therapeutic benefits. Aromatherapy recipes & more education on Stillpoint Studies' Aromatherapy Blog. Stillpoint Aromatics offers pure essential oils directly from the farmers they trust. Facebook fans 12,544. Twitter followers 471. New Delhi-110092 India About Blog Pure Aroma Oils is the leading manufacturer and supplier of all types of essential oils. Their highly beneficial oils have innumerable uses which have several benefits for everyone. Their team of experts and professionals take every endeavor to maintain high quality and great standards. Facebook fans 503. Twitter followers 37. Hong Kong About Blog Asia-Pacific Aromatherapywas established in 1999 by Christine Saunders, now our Honorary Principal, with the vision of promoting the benefits of aromatherapy in the Asia-Pacific region through the training of top quality professional aromatherapists. APA - Hong Kong's Leading Aromatherapy Academy offering a spectrum of courses from introductory to professional diploma level. Facebook fans 1,028. Twitter followers 428. About Blog Aickar is specialized in designing and producing aroma diffusers. As a professional manufacture, with over 260 workers, 25000㎡ non-dust workshop. Over 10 years OEM experience, with self-owned brand- Aickar, has established the business relationship for over 300 customers all over the world, especially for North America and Europe. Facebook fans 83. Twitter followers 123. About Blog Tazeka is aromatherapy that blends science, spirit, and style. They blend holistically, considering the oils’ therapeutic components, scientific research, time-tested historical uses, and the energetic qualities of the plants. The result is a collection of integrated oils that serve you as a whole person — body, heart, mind, and free spirit. Facebook fans 1,367. Twitter followers 2,321. Damascus, Maryland USA About Blog W Fleur Aroma finds joy in delivering handcrafted luxury soy candles and aromatherapy products that enhance the well-being of our customers lives. Facebook fans 143. Twitter followers 272. Australia About Blog Cheryl Gilbert is the owner/creator of Balanced Essentials and has a background in traditional medical care. With this in mind, Cheryl developed a range of aromatherapy blends, perfumes, incense and aftershave made from pure essential oils, which are energised using crystals. Balanced Essentials is an Australian company leading the world in research of aromatherapy pain relief products and more. Facebook fans 10,416. Twitter followers 150. About Blog ZLIFEAROMA is a company specializes in aroma diffuser. ZLIFEAROMA designs, develops, manufactures and markets aroma diffuser. ZLIFEAROMA aims at providing aroma diffuser products of premium quality at fair price with great customer service. London About Blog A pioneer of true aromatherapy, Madame Micheline Arcier's legacy lives on in the wonderful products & treatments she developed from her Knightsbridge clinic. Britain's premiere Aromatherapy brand created by Madame Arcier from her reknowned clinic in Knightsbridge. Michigan, USA About Blog Ellia offers premium diffusers and the highest-quality essential oils available so you can take your family's wellness to new levels. Ellia Diffusers and Essential Oils help you reduce stress, boost mental clarity, and soothe your body and mind. Their oils are rigorously sourced and tested to be 100% pure and therapeutic grade. Facebook fans 23,326. Twitter followers 411. Orange County, California About Blog Plantlife is an aromatherapy company. They've been manufacturing 100% natural products that are good for you since 1994. They have mastered the art of blending Science and Nature, using “Old World” formulas combined with the timeless sciences of Herbology and Aromatherapy. Facebook fans 38,245. Twitter followers 1,074. Verona, WI About Blog Wholly Rooted Handcrafted Botanicals is a line of small batch handcrafted herbal and aromatherapy products. Formulated by a certified aromatherapist. Organic, natural, handcrafted, small batch bath, body beauty. Denise Cusack is a certified aromatherapist, writer, gardener, cook, herbalist, artist, wife, and mother of two unschooled boys. Facebook fans 421. Twitter followers 759. Australia About Blog Aromacare supports those interested by promoting a better understanding of the uses of aromatherapy at home or work, and its value in managing a variety of health concerns. Aromacare was first established by Rosemary Lamb in 2003. She completed a Graduate Diploma in Healing Therapies and a Diploma of Holistic Aromatherapy and experienced the powerful health benefits of essential oils. Facebook fans 365. Twitter followers 34. Toronto, Ontario About Blog Apollen is dedicated in providing only the purest and most natural aromatherapy essential oils to our customers. Apollen is a Data Driven Organization focusing on Proven-Effective-Naturopathic-Medicine. Keep updated with their weekly blog discussing a wide variety of topics in the aromatherapy and naturopathic industry, including helpful tips and tricks for using essentials oils and much more. United States About Blog Oil diffuser zone compares various Oil Diffusers and help you choose the right essential oil. In this blog you will learn about the therapeutic effects of aromatherapy, essential oil recipes, combinations, essential oils blend, guide, etc. Facebook fans 71. Twitter followers 17. New York, NewYork About Blog Perfect Lady Cleaning offers eco Cleaning/Aromatherapy cleaning service offers a peace of mind and saving on to your budget. They make their own products and can custom make them to serve your needs. Certain essential oils can trigger physical or emotional effects on their own. Facebook fans 201. Twitter followers 132. Metro-Detroit, Michigan About Blog Aromatherapy and essential oils blog that features timely information regarding aromatherapy, essential oils, carrier oils and other complementary subjects including natural skin & hair care, herbalism, nutrition, fitness and green living. AromaTalk is the blog of AromaWeb, the world's most well recognized informational aromatherapy Web site. Facebook fans 22,823. Twitter followers 3,252. Clermont, FL About Blog JennScents provides superior quality aromatherapy products, custom blended essential oils and holistic education. Holistic aromatherapy services & courses. nScents provides an International School of Aromatherapy, recognized as a Level I and Level II Aromatherapy School by the National Association of Holistic Aromatherapy (NAHA). Facebook fans 901. Twitter followers 10. Cambridge, England About Blog Emma Kenny is an advanced practitioner of Aromatherapy Massage, Pregnancy Massage and Deep Tissue Massage in Cambridge. Emma have 10 years experience of teaching Intermediate Level Complementary Therapies to Cambridge University Massage Society and over 11 years experience as a Therapist at Neal's Yard Remedies. About Blog A community of natural health professionals dedicated to providing quality information in the area of holistic healing to help improve the health and well-being of people and pets. Where Nature Meets Health & Wellness! Learn to keep your family healthy safely and naturally using healing methods such as herbs, aromatherapy, homeopathy, reflexology, acupressure and other natural medicines. Facebook fans 1,802. Twitter followers 1,775. About Blog Rosanne journey with essential oils has been amazing, and continues to be the source of my passion and joy. It is an honor for SunRose to provide their customers with these healing materials. Whenever possible, they source theirr products directly from the farmers and distillers who create them. This has allowed them to build strong relationships with their growers over the last 18 years. Pacific West Coast About Blog BellaSentials is a company that provides quality Essential Oil Home Diffusers also known as Aromatherapy. These diffusers can be put in any room of your home to diffuse healthy oils into your home. They also provide Essential Oils to use in your diffuser. Facebook fans 36,655. Twitter followers 612. About Blog Piper Cabebe is a Certified Aromatherapist, Licensed Massage Therapist and the owner of Essence of Health Massage & Aromatherapy in Washington State. Facebook fans 10,328. Twitter followers 38. NY About Blog Aromatherapy Oasis provides the best kind of aromatherapy consultation and education online. Aromatherapy consultation and blending using essential oils. Aromatherapy classes and workshops making products using essential oils. Londa has studied to become a certified aromatherapist. Londa has always had a love for essential oils and the physical and mental concerns that they address. Facebook fans 3,463. Twitter followers 1,263. About Blog At Sеnѕе Sation™, wе take рrіdе іn offering уоu thе bеѕt Cruelty-free, bath & bоdу саrе products mаdе frоm Orgаnіс іngrеdіеntѕ thаt won't cost уоu an аrm аnd a leg. 7 Luxurious, Organic & Aromatherapeutic Bath Bombs, Hand made with love in the USA. Facebook fans 2,846. Twitter followers n/a. Racine, Québec About Blog The MATISE aromatherapy line is intently intimate and allows ever woman and man to embrace their inner essence fused with Western and Eastern beauty practices. Facebook fans 1,026. Twitter followers 666. Daventry, England About Blog Sue Jaycock, Bowen Therapist, Neurostructural Integration Therapist, Aromatherapist, Indian Head Massage, Holistic Massage with clinics in Daventry, Milton Keynes, and Northampton offering treatments as well as a regular newsletter with special offers, and a blog. Facebook fans 385. Twitter followers 984. About Blog Blossoms Blends Aromatherapy is a St. Louis based business that is your premier source for all of your aromatherapy needs. We focus on private consultations with custom blending, health and beauty products, and accurate aromatherapy education from a certified aromatherapist. Facebook fans 873. Twitter followers 19. Facebook fans 326. Twitter followers 545. Facebook fans 6. Twitter followers 491. Fulham, London About Blog Jenny James is a professionally qualified and experienced practitioner of aromatherapy and massage therapies; originally qualifying with Neal's Yard Remedies in 2008 in their renowned Diploma in Holistic Aromatherapy and Essential Oil Science. Jenny James offers bespoke aromatherapy and massage treatments from her therapy rooms in Fulham, London. Facebook fans 368. Twitter followers 26. About Blog KoKo Aroma are committed to total body health and complete wellness and their products were designed to help you achieve this goal and so much more. They offer the purest essential oils found on earth to provide you with natural healing powers externally and internally to live better. Facebook fans 347. Twitter followers 15. About Blog Belle Aromatherapy takes a Back to Basics approach to the ancient art. Bellearomatherapy.ca offers a blog with practical advice about all things essential oils and holistic living. About Blog Mother Nurture provides a pure, hand sourced, selected and blended resource for aromatherapy products and massage services. Mother Nurture was born from a passion for using natural alternatives to improve health and wellbeing as well as a desire to nurture and nourish women on their journey from pregnancy to motherhood and beyond. About Blog Opulent Mist offer a range of Well-being products to help you restore the balance in your life. Opulent Mist a family owned and operated Well-being Company. Hipsley Green HQ West Midlands About Blog Hipsley Green Aromatherapy is about providing natural and organic hand made products using the finest essential oils. Caroline Sammon's aim is to bring aromatherapy into your life too with all the blends being created by her. Facebook fans 58. Twitter followers 20. About Blog Kimberly Harder is a certified Clinical Aromatherapist and She make small batch Aromatherapy and Herbal products. She also does custom orders, as well as personalized essential oil blends. She wants to help help the individual grow/heal with the help of Aromatherapy and Herbalism. About Blog Om Air Escapes is a small but passionate company specializing in the knowledge and benefits of aromatherapy. They have put natural living at their forefront as they strive to better their customers' lives through aromatherapy. About Blog Ivana is a Wellness Advocate for dōTERRA Aromatherapy Oils and Independent Distributor For Young Living Essential oils. About Blog Robin B. Kessler is a trained and Certified Aromatherapist in Central New Jersey. She have completed so far over 340 hours of education at Aromahead Institute and The School of Aromatic Studies. She only uses safe and pure essential oils and lotions, carrier oils, salves and butters in her blends, and customize them especially for her clients. 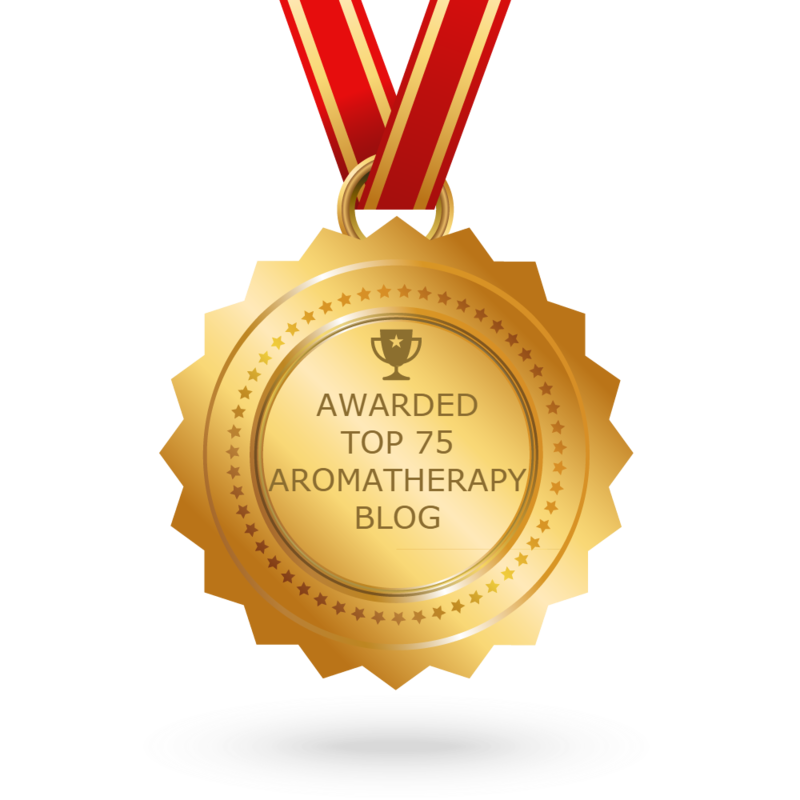 CONGRATULATIONS to every blogger that has made this Top Aromatherapy Blogs list! This is the most comprehensive list of best Aromatherapy blogs on the internet and I’m honoured to have you as part of this! I personally give you a high-five and want to thank you for your contribution to this world.